No doubt that Beton is going to be a summer hit. For the 50th time in a row. The refreshing Beton on the rocks is just as tasty as it has ever been for the last 50 years. This summer though, we are going to be able to enjoy it just a little different. The grand opening of the Becher´s Beton Bar will make it possible introducing 5 specials with tastes out of this world which you certainly do not want to miss out on! Just like Becherovka itself, Beton has become a legend throughout the years, too. This year, though is slightly different with Becherovka joining forces with 5 craftsmen who pulled out all the stops and gave this legendary beverage a special touch. The result is 5 original recipes – Jablčnô, Herbert syrups, The Lovely Food, The Padre Craft Brew and The C Café out of which even the most fastidious customer can choose. For beer lovers a combination of Beton and wheat beer and those, who prefer something sweeter, combinations with fruit syrups are available. Becher’s Bar haven’t forgotten about those either, who like to experiment – an unconventional combination with coffee is ready to be enjoyed. „Becherovka has been associated since its inception with passionate people, just like Jan Becher himself was. Becherovka fans just like pretty much everyone appreciate things done with love and passion, we could attest to that for sure while witnessing Becher’s Market where last summer all enthusiasts had the chance to join a competition to win original works by upcoming artists as well as the fall season with recipes conceived by the cooking duo Coolinári. 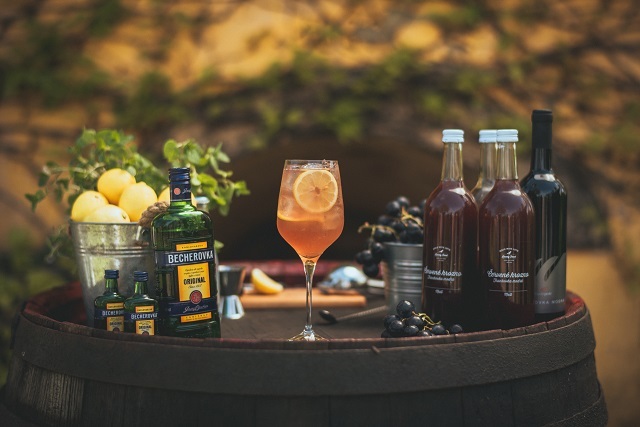 We are confident that summer drinks from the Becher’s Beton Bar mixed by skilled craftsmen will enjoy similar popularity and provide refreshment in the scorching heat, “as the Brand Manager in Slovakia Zuzka Benková summed it up. Directions: Pour the appropriate amount of Becherovka, lime juice and top it up with ice up to the rim of the glass, pour in Tonic and wheat beer. Stir lightly, add the lime and mint leaves. Enjoy! Directions: Pour the appropriate amount of Becherovka, lemon juice and grape juice and top it up with ice up to the rim of the glass, add 2 slices of lemon and pour in tonic. Stir lightly. May garnish with fresh grape berries. Directions: Top a tall glass up with ice cubes all the way up to the rim, pour in Becherovka and tonic, stir and pour in cold espresso. Enjoy!